Throughout your working years, you paid into Medicare. In fact, 1.45 percent of your check goes to Medicare and your employer pays another 1.45 percent. If you’re self-employed, you pay the entire 2.9 percent. Unfortunately, retirement doesn’t mean you stop paying into Medicare. Part A is free for most people, but parts B and D come at a cost. Let’s look at the Medicare Part B fee structure. Before we look at the fees, here’s a word of caution: Make sure you sign up for Medicare Part B when you turn 65. Social Security recommends enrolling up to 3 months prior to your 65 birthday. If you don’t sign up during the initial enrollment period—3 months prior to 3 months after you turn 65, you might have to pay a late enrollment penalty fee. Remember that 1.45 percent or 2.9 percent Medicare deduction you begrudgingly paid for decades? That covers Part A but Part B comes with a monthly premium that is deducted from your Social Security benefits. If you don’t get Social Security or related benefits, Medicare will send a bill. The standard monthly premium for 2018 is $134 but the premium is based on income. It’s possible that you’ll pay slightly less as well. The federal government pays about 75 percent of cost of the Part B premium, leaving the person with only 25 percent of the cost. For higher income individuals, they will pay a larger percentage—35 percent, 50 percent, 65 percent, or 80 percent depending on their earnings. 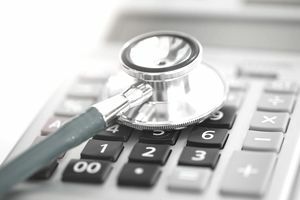 Social Security calls it the, “income-related monthly adjustment amount.” Don’t worry, though—Social Security estimates that only 5 percent of all Medicare recipients will pay more than the $134. If you’re paying higher Part B premiums, look at it as a good problem to have. To determine if you will pay the extra fee, Social Security looks at your most recent tax return on file with the IRS. If you’re married, filing jointly you’ll start paying higher Part B premiums when your modified adjusted gross income is above $170,000. If you file your taxes using a different status, your magic number is $85,000. If you make between $170,000 and $214,000 or $85,000 to $107,000, your premium will be $187.50 per month. Finally, if you’re married filing jointly and making more than $320,000 or otherwise making $160,000 per year, first congratulations, and your premium is $428.60 per month. It’s also possible that you could pay slightly less than the standard $134 but not much. Social security says that people who receive a deduction will only pay about $4 less per month. Contact Social Security for more information. Yes, you can. If you disagree with Social Security’s determination of your monthly premium, you can file an appeal. The easiest way to file the appeal is online. You can also appeal in writing or visit an office. The deductible sounds low and the 20 percent number is pretty standard but there’s a very important catch—there’s no cap on that 20 percent. You might have had insurance through a past employer where you paid 20 percent of costs up to a certain amount and after that you paid nothing. With traditional Medicare, there’s no cap on the 20 percent. This could represent a very large bill depending on your medical treatment. Because traditional Medicare can leave you with very high out of pocket expenses, many people elect to enroll in a Medicare Advantage or Medigap policy. These are policies through outside insurance companies that extend Medicare’s coverage for an extra monthly fee. The fees depend on your chosen plan. Parts A and B, and sometimes Part D are combined into one of these plans, sometimes referred to as Part C.
Insurance professionals often recommend supplemental coverage to product against financially catastrophic medical bills that traditional Medicare doesn’t cover. Why Is There a Late Enrollment Penalty for Medicare?